Saturday November 17th Combat Zone MMA returns to downtown Manchester, New Hampshire and their home inside the Doubletree by Hilton Downtown Hotel as Calvin Kattar presents Combat Zone MMA 68: The Return. Combat Zone will roll out an 11 fight pro-am card that includes “The Return” of former Combat Zone owner/ promoter David George (2-1); who will make his return to the cage after over eleven years away from the sport. Now 35 years old; George will be fighting for the first time since he walked away from the sport following a first round knockout loss at the hands of Danny Lauzon at Combat Zone 24 in 2007. George will welcome David Espino (2-2) into the cage he once owned as these men throwdown at a Catchweight of 160 pounds as part of a seven fight professional main card. 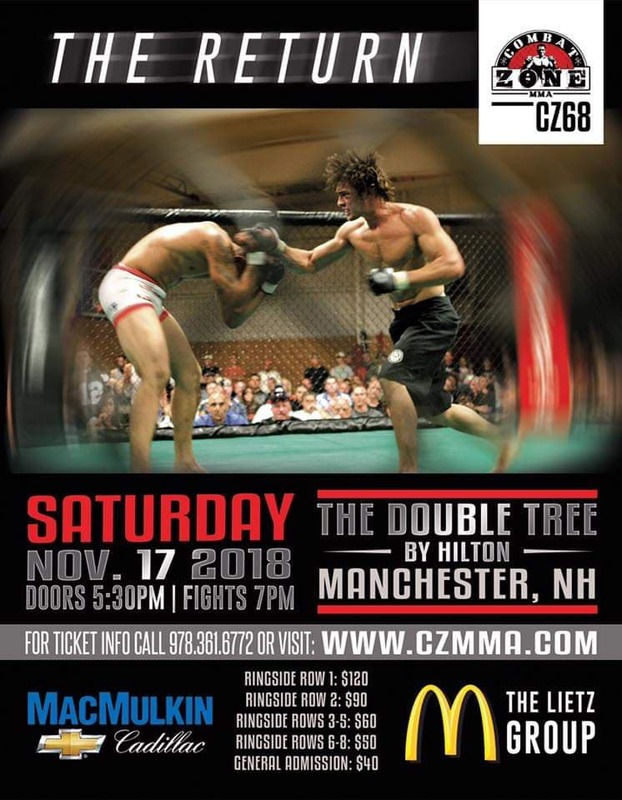 Fellow Combat Zone veterans Jesse McElligott (5-3;Combat Zone 32 and 33) and Ray Shawdee (5-3; Combat Zone 40,46,62) will square off in the Middleweight Division. Undefeated Featherweight Prospect Brendan Marotte (3-0) looks to keep his record clean as he meets Joey Sanchez (0-1) in the Combat Zone cage. Highly touted and fan favorite Bantamweight; Jake “The Gorilla” Pilla will make his long awaited professional debut against Vermont’s Kenny Lewis (0-1). Sityodtong product Gerald Meuse will make his professional debut in the Combat Zone cage when he locks horns with Jesus Cintron (0-3) and rounding out the professional undercard big men Terrance Jean-Jacques (1-1) and Jahnell Parkinson (1-0) both vie for their second professional victories as they match whits in the Light-Heavyweight division. A stacked undercard leads us to a very highly anticipated main event that pits perhaps the top unsigned New England Featherweight prospect; Vovka Clay (8-2) who will be seeking his sixth straight victory when he welcomes Oklahoma’s JR Coughran (6-1) to the New England scene. Last Fight: Second round Submission loss (Armbar) to Nick Fiore at Combat Zone 66. Last Fight: First round Guillotine choke of Tom Pagliarulo at Combat Zone 65. Breakdown: Brady has looked good in his first two Amateur bouts, having earned first round submissions victories in both contests. Brady will meet the biggest test of his young career Saturday night as he takes on Nate Ghareeb who will be looking to shake off back to back losses for the first time in his career against two tough customers in Matt Biena and Nick Fiore. Last Fight: First round Submission loss to Nick Johnson at Cage Wars 37. Last Fight: Second round Submission of Caynen Wills at Combat Zone 67. Last Fight: First round Knockout of Anna Brown at Combat Zone 62. Last Fight: This bout will be Chrystal’s first MMA fight. Breakdown: These girls threw down in a Kickboxing match at Combat Zone 67 that was very closely matched, Marini ultimately earned the decision victory in what turned out to be a pretty tough fight to score. These ladies will trade the Boxing gloves for MMA gloves as they look to settle the score, under a different set of rules this time. Last Fight: Majority draw with Zach DiSabatino at Cage Titans 34. Last Fight: First round Submission loss to Nick Alley at Combat Zone 67. Breakdown: Jesus Cintron has had been fed to the buzzsaw of New England Welterweights having gone toe to toe with Reginaldo Felix, Pat Casey and Nick Alley, having been finished in all three of those bouts. Cintron will have another tough task when he meets Sityodtong product Gerald Meuse who will be making his professional debut. Last Fight: First round Knockout of Rob Best at Combat Zone 67. Breakdown: Marotte will be looking to make it four consecutive professional wins to start out his professional career all coming in this calendar year, as the New Hampshire native is as hot a prospect as they come, having reeled off three consecutive knockouts to kick off his professional campaign. Marotte will be looking to make an example out of the 33 year old Rhode Island native Sanchez who will be gunning for his first professional victory. Last Fight: Unanimous Decision victory over Victor Irwin at Combat Zone 67. Last Fight: Split Decision victory over Victor Irwin at Premier FC 24. Breakdown: This fight was a natural progression in the making, both of these physical big men are coming off decision wins against Victor Irwin making this meeting an almost foregone conclusion. Both of these men have the power to finish this fight wherever the fight goes but I see this fight playing out in close quarters, with Terrance looking to push the pace and get this fight to the ground early. This is a tough fight to call and it really depends on both of these fighters showing up with their full complement of tools. Last Fight: First round Submission victory over Rob Fuller at Combat Zone 65. Last Fight: First round Knockout loss to Randy Costa at Cage Titans 40. Breakdown: Jake Pilla has without a doubt been one of the crown jewels in the Combat Zone organization for some time now, as the promotions former Amateur Bantamweight Champion makes his long awaited professional debut. Pilla will be looking to put his high level grappling and heavy top game to the test in this one when he takes on Vermont’s Kenny Lewis. Last Fight: First round Knockout loss to Will Santiago at Combat Zone 62. Last Fight: Unanimous Decision loss to Pat Walsh at CES 30. Breakdown: This fight is very intriguing on paper, both of these guys are old school, hard nose grapplers who have been around this sport for a very long time. McElligott has been out of the game for a while not having fought since CES 30 in 2015 but he is back with something to prove when he meets fellow veteran Ray Shawdee in the cage Saturday night. This is another tough fight to call given the circumstances, with both of these talented veterans possessing well rounded attacks and similar cage expeciance, this should be a grappling war for the ages. Last Fight: First round Submission victory over Bradley Sustad at AMMO Fight League 5. Breakdown: David George will be back in the cage for the first time in 11 years Saturday night when he goes to battle for the promotion he used to own and operate. The now 35 year old George, who sold Combat Zone to the Kattar brothers in 2014 will make his return to the Combat Zone cage against the hungry David Espino who will be looking to improve on back to back professional victories. Last Fight: Second round Doctor Stoppage (Cut) victory over Aaron Lacey at Combat Zone 64. Last Fight: Second round Submission loss to Alex Gilpin on Dana White’s Tuesday Night Contender Series 2018. Breakdown: This fight is everything you look for in a regional main event; two fast rising prospects in the primes of their careers. New England MMA fans should be very familiar with the work of Vovka Clay, who has choked out his competition on the way to an impressive 8-2 record and top regional Featherweight status. Coughran’s prospect status took a little hit in his last showing, when the formally undefeated prospect fell victim to an Alex Gilpin submission on Dana White’s Tuesday Night Contenders Series. Coughran will be showcasing his talents for a different set of fans this time as he hopes to silence the Combat Zone crowd with an upset of the strangler Vovka Clay. This fight should be epic!